I am so sorry to do this to you all, but I have to take a sharp left turn off of gerbil babies (whom I am henceforth referring to as Gerblets—like giblets, but alive). She is our awesome dog. 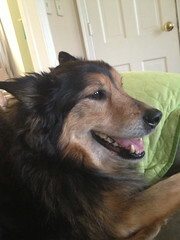 Cassidy is 13 years old and has been having health problems for a while. She has on and off liver and kidney issues and has chronic joint issues as well as incontinence and lots of itchiness. She seems confused a lot of the time. Sometimes I have to carry her up and down stairs. She takes a lot of medicine. We’ve known for a while that she didn’t have a long time, but she has deteriorated a lot over the past couple of weeks. Just this evening, she took a nose dive. She is hunched and limping and breathing really hard. Saturday (tomorrow) afternoon the vet is coming to put her to sleep. I know it’s the right thing to do. I know it. But tomorrow is going to be horrible. We are going to miss her a lot. The kids are ready—as ready as they can be. We’ve been talking about her being sick for a while. When we saw how quickly she was starting to not feel well, we started preparing them for this happening. And now we’ve told them that tomorrow afternoon they’re going to go over to a friend’s house and the vet is going to come to our house and help Cassidy die. Quinn decided that he wanted to have a party for Cassidy today. So we had a party to celebrate her. 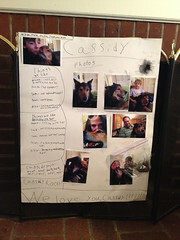 We gave her a can of dog food (and we ate cake and bone-shaped graham crackers), took photos with her, and we made her a poster to show her how much we love her. We’re going to miss her. I have spent 13 years with her following me around virtually all day, every day. The house is going to be very different without her.